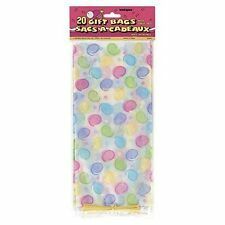 ---This listing is for a pack of 20 Colourful Polka Dots Spots Sketch Cellophane Loot Treat Gift Party Bags with Twist Ties. ---Each of these fantastic cellophane bags features a stylish design filled with brightly coloured sketchy polka dots printed on transparent plastic. ---Every bag comes complete with a matching twist tie. ---(Crepe paper & contents NOT Included) ---Perfect for any occasion these attractive party bags are fantastic for Birthday parties and great for handing out sweets and treats to your party guests. ---Please Check Our Shop For All Of Our Party Items. Party Bag Fillers : Upto 99p. Party Bag Fillers : �1.00 - �1.99. Party Bag Fillers : �2.00 - �2.99. 12Baby Blue Paper Gift Bags. Party Bags. ---This is a Packet of 30 Large Pink Plastic Party Gift Bags. ---Each of these great value cellophane bags is approximately 11.5" x 5" in size and pink in colour. ---Every bag comes complete with a matching twist tie. ---Perfect for any occasion and a great way to give away your fantastic party treats these great value packs are ideal for children's parties. ---Please Check Our Shop For All Of Our Party Items. ---Includes 12 pink paper bags ---Approximately 10" x 5.5" in size. ---Perfect for handing out sweets and treats whatever the occasion ---Please take a look in our shop for more fantastic party items. Each bag is approx 18cm x 22cm (7in x 9in). 12Orange Paper Gift Bags. Party Bags. Party Bag Fillers : Upto 99p. Party Bag Fillers : �1.00 - �1.99. Party Bag Fillers : �2.00 - �2.99. Part of the Oh! Fill these party bags full of goodies for your guests. Sweets look great as you can just peek what is in there! 12 x Sunshine Yellow paper bags. Party / Treat Bags. cm - 27.3 tall x 14 wide 9 deep. 30Royal Blue Cellophane Bags. Party Bags. Party Bag Fillers : Upto 99p. Party Bag Fillers : �1.00 - �1.99. Party Bag Fillers : �2.00 - �2.99. Polka dot design, and wire ties included. Multi coloured balloon print design. An ideal solution for all your party needs. (Excluding Isle of Man, Channel Islands, Scottish Islands). 30Hot Pink Cellophane Bags. Party Bags. Party Bag Fillers : Upto 99p. Party Bag Fillers : �1.00 - �1.99. Party Bag Fillers : �2.00 - �2.99. Party Bag Fillers : Upto 99p. Party Bag Fillers : �1.00 - �1.99. Party Bag Fillers : �2.00 - �2.99. 12x Purple Paper Gift Bags. Party Bags. 20x Hot Pink Spotty Cellophane Gift Bags. Party Bags. Party Bag Fillers : Upto 99p. Party Bag Fillers : �1.00 - �1.99. Party Bag Fillers : �2.00 - �2.99. 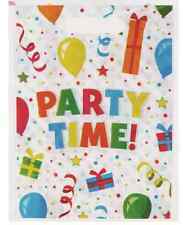 POLKA DOT PAPER VARIOUS COLOURS PARTY BAGS X 50 7" X 9"